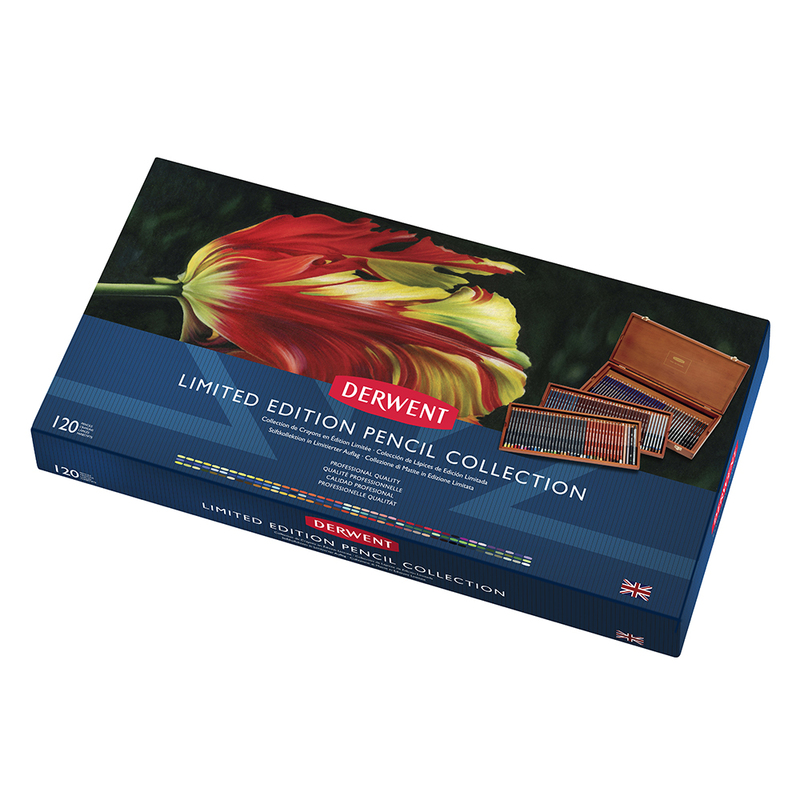 What better than having all your favourite Derwent pencils in one place! 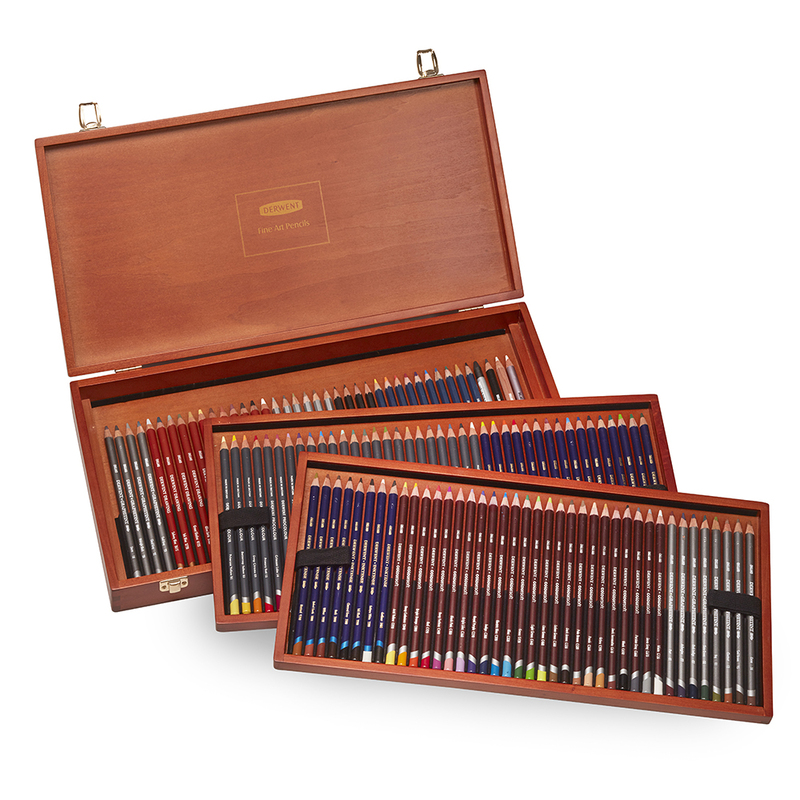 This wonderful limited edition collection box containing no less than 120 pencils will make the perfect present for any art enthusiast. This collection features a wonderful mix of your old favourites like Derwent Sketching, Drawing, Coloursoft, Metallic and Watercolour with some of Derwent's newest innovations like Graphitint, Inktense and Procolour. 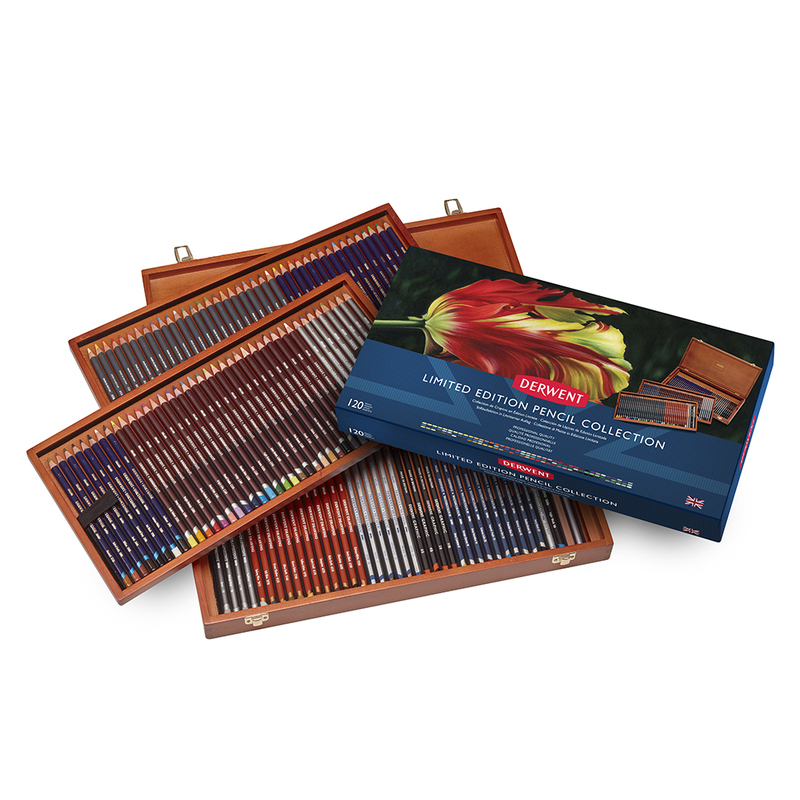 The collection is housed inside a functional, yet beautiful maple box with 3 layers of pencils. The box can be laid flat for easy access. 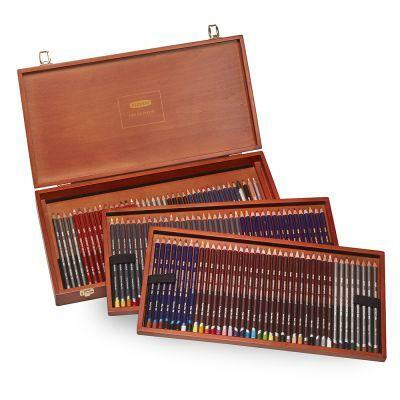 To see which pencils are included in this box set, select the 'contents' tab above. 24 Procolour Pencils - Primrose Yellow, Buttercup Yellow, Deep Chrome, Primary Red, Crimson Lake, Cerise Pink, Heather, Imperial Purple, Prussian Blue, Spectrum Blue, Midnight Blue, Distant Green, Sap Green, Cedar Green, Grass Green, Foliage, Burnt Umber, Brown Ochre, Sunset Gold, Nutmeg, Gunmetal, Blue Gre, Ivory Black, Chinese White. 12 Derwent Drawing Pencils - Solway Blue, Ink Blue, Green Shadow, Olive Earth, Brown Ochre, Yellow Ochre, Sepia (Red), Sanguine, Ruby Earth, Chocolate, Ivory Black, Chinese White. 10 Watercolour Pencils - Deep Cadmium, Oange Chrome, Deep Vermilion, Crimson Lake, Imperial Purple, Spectrum Blue, Prussian Blue, Mineral Green, Golden Brown, Ivory Black. 24 Coloursoft - Acid Yellow, Deep Cadmium, Bright Orange, Red, Deep Fuchsia, Blush Pink, Bright Lilac, Royal Purple, Indigo, Electric Blue, Blue, Green, Light Green, Lime Green, Lichen Green, Dark Brown, Pale Brown, Peach, Ochre, Dark Terracotta, Persian Grey, Dove Grey, Black, White. 6 Metallic - Silver, Pewter, Gold, Antique Gold, Bronze, Copper. 12 Graphitint - Port, Aubergine, Dark indigo, Slate Green, Ivy, Chestnut, Cool Brown, Cocoa, Storm, Midnight Black, Cloud Grey, Cool Grey.